While there really aren’t too many compressors under a hundred bucks, you can actually get a decent unit in this price range if you only plan on doing small tasks around the house. If all you need is something to inflate your car tires, blow up a few inflatable toys, or install some trim, any one of these will do. 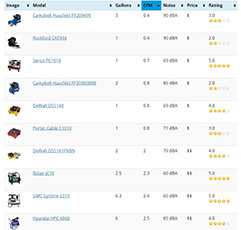 Don’t expect these models to last you 10 years like some heavier duty (and more expensive) models, but for the money, these will be a sound investment as long as you don’t overestimate them. There isn’t another compressor we can think of that puts out 2.8 CFM at 90 PSI and costs under $100. 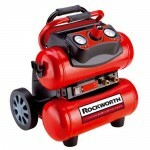 If you’re not familiar with Rockworth compressors, you’re not alone. The exact same compressors are also sold under the Husky brand name which cost a bit more. Build quality seems a bit cheap (ex: plastic wheels) but its airflow will actually allow you to run a couple nail guns at the same time. For less than $100, they are a good deal. Keep an eye on price as it seems to fluctuate between $100-120. Porter-Cable is much more recognized brand than Rockworth. 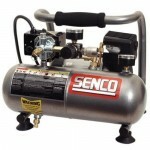 Their entry-level air compressor, the C1010, is a solid little compressor which churns out less than 1 CFM at 90 PSI. While it may not seem much, it’s perfectly capable of operating a finish or brad nailer as well as the normal inflating “stuff” jobs around the house. At only 23 pounds, it super portable and is very quiet as far as air compressors go. Built in are handy features such as a roll cage and cord wrap. It’s possible to find the C1010 under $100 but more likely, a few dollars more (still a good buy). Yes, another 1010 model but by a different brand. Not much more to be said about this fantastic Senco. While technically a few dollars over $100, it’s to good not to mention. It would be the overwhelming #1 if it were about $10 less. 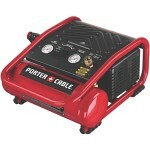 It has about the same amount of airflow as the Porter-Cable above, is even queieter and lighter, and is more durable than either option above. Great for tire inflation, finishing work, and all sort of hobbies. If you want to get a cheap compressor you won’t regret purchasing, the PC1010 is a great pick.